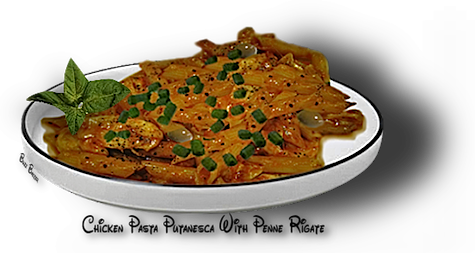 Pasta putanesca literally means "Harlot's Pasta". It was made by the ladies of the night in Italy after a days work. It was a throw things together from the fridge thing. It didn't take a lot of time to make and is of course delicious. When you make this, use what you have..................substitutions and quantities are a personal choice. When I make it ....it never tastes the same twice. A colorful name for a very colorful and delicious dish. lightly caramelized, about 6 minutes. 2. Add the garlic and cook an additional 2 minutes. Remove garlic and onions and set aside. 3. Brown off chicken thighs in remaining oil. sauce is thickened and slightly reduced,  about 40 minutes.